Arrow -The arrow stands for moving forward--this symbol shows a wish to change the world. The troop crest is chosen by a Girl Scout troop. Bee - Bees symbolize hard work and industry. The bee can show that girls want to inspire others through their words and deeds. The troop crest is chosen by a Girl Scout troop. Bluebird - Bluebirds, known for their bright color and cheerful song stand for happiness and good fortune. The troop crest is chosen by a Girl Scout troop. Carnation - The carnation - one of the first two troop crests - stands for health and energy. The troop crest is chosen by a Girl Scout troop. Crane - The graceful crane stands for strength, gracefulness and energy. The troop crest is chosen by a Girl Scout troop. Eagle - The eagle's sharp eyes help it see important details--this symbol stands for focus and hard work. The troop crest is chosen by a Girl Scout troop. Lei - The Hawaiian lei is a symbol of friendship, love and peace. The troop crest is chosen by a Girl Scout troop. Lightning - A bolt of lightning stands for inspiration and creative power. The troop crest is chosen by a Girl Scout troop. Nautilus Shell - The nautilus shell keeps growing and changing throughout its life-just like a Girl Scout. The troop crest is chosen by a Girl Scout troop. Pansy - The cheerful pansy stands for loving thoughts and special friendships. The troop crest is chosen by a Girl Scout troop. Shooting Star - Shooting stars are rare, unexpected, and beautiful. This symbol shows that girls are special and ready to light up the world. The troop crest is chosen by a Girl Scout troop. Sun - The sun represents warmth and life -- This symbol helps to spread good cheer. The troop crest is chosen by a Girl Scout troop. Trumpet - A trumpet says "ready to march" -- this symbol shows that girls are prepared to take action and make the world a better place. The troop crest is chosen by a Girl Scout troop. Unicorn - The mythical, beautiful unicorn is a symbol of courage. The troop crest is chosen by a Girl Scout troop. Waterfall - The waterfall shows that girls want to stay true to themselves--even though the world is always changing. The troop crest is chosen by a Girl Scout troop. 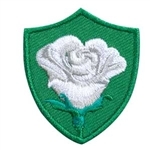 White Rose - The white rose--one of the first two troop crests--stands for new beginnings. The troop crest is chosen by a Girl Scout troop.